I have created my views. 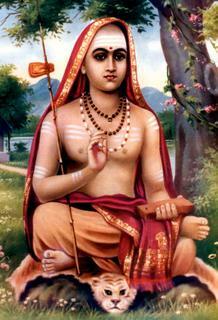 Adi Sankara Bhagavatpada was born at Kalady in Kerala in a Namboodiri Family. His mother was Aryamba and his father died very early. When he wanted to take up sanyasa very much against the will of her mother, she finally agreed with a condition, that He should be present near her death bed and also he should perform the obsequies. Sankara agreed for this and took up Sanyasa. When he was at Sringeri, he realized that his mother was nearing death and by the power given to him by God reached there immediately. He was near his mother at the time of her death and also performed the funeral ceremonies. It was at this time he wrote this five slokas which came out deep from his mind. This was possibly the only poem he wrote, which is not extolling any God and also not explaining his philosophy. Mother has been extolled as a god form in several places in the puranas and also God has been approached as a son approaches his mother by many great savants. She is Dhatree (One who bears the child), Janani (one who gives birth to the child), Ambaa (One who nourishes the limbs of the child) and Veerasu (One who makes him a hero), Shusroo (One who takes care of him). But Sankara in these poems is not dealing either of God in the form of mother nor mother in the form of God. He laments to the lady who was his mother and points out how his conscience is pricking him for being not able to do the duty of a son. nishkruthi munnathopi thanaya tasya janyai nama. Even by my becoming great. Oh Hari and Oh God Mukunda,"
I can give you but humble prostrations. akale samprapthe mayi kuru dhayaam matharathulaam . For I have arrived here late to attend to those. I give you but dry rice in your mouth.